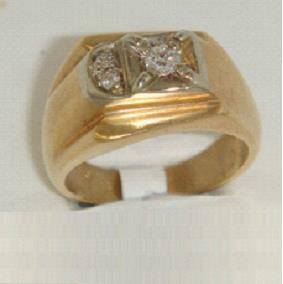 10k mens yellow gold ring has 0.20* total carat weight of diamonds set in a 10k white gold setting. All prices are in Canadian dollars. 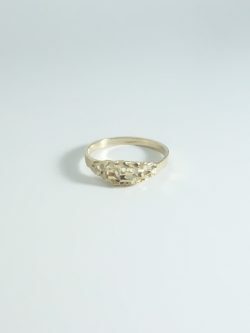 14k yellow gold ring with a round peridot and a round diamond on each side. 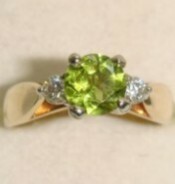 Peridot: 0.80ct. * Diamonds: 0.14 total carat weight* *all measurements are approximations. All prices are in Canadian dollars. 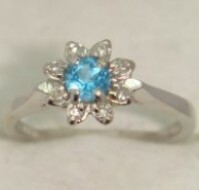 14k white gold ladies ring with a round blue topaz surrounded by round diamonds. 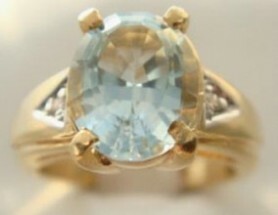 Blue Topaz: 0.33ct. * Diamonds: 0.41 total carat weight * *all measurements are approximations.